Lyle: To get a good country sound from your electric guitar, try using the bridge pickup, clean amp setting, splash of reverb, or any steel string acoustic! Lyle: This lesson is in the key of D. The main chords for the key of D are: D, G, and A. These are called the 1 - 4 - 5 chords in D.
Lyle: You might have learned from somewhere else that the II chord is always minor. In country style music the II chord is almost always major, adding an extra "twang" to the sound, or also know as a secondary dominant. Lyle: To get the country style rhythm, I like to use the alternate bass notes. Use all down strokes for each event in the measure. 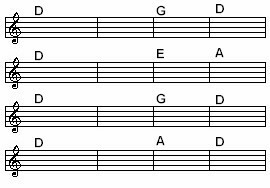 The alternate bass notes come from the 5th degree of each chord. Lyle: When playing lead riffs against country style music you often use major pentatonic scale patterns. Soloing against the D maj chord you would use the D maj pentatonic scale for the riffs. Lyle: These are just 1 octave patterns that are movable to any key. I've highlighted the root notes for each key. There are many other places and patterns to learn for these scales at a later time. Lyle: When the chords change like to a G, you change to the G maj pentatonic scale. Simply follow each chord in the progression with the correct maj pentatonic scale. Lyle: Keep your pinky (4th) finger laying down on the first two strings for this riff. Notice in measure two there is a pre-bend/release from the 11th fret to the 9th. Lyle: I like to use a pick for rhythm guitar, fingers for the country lead style guitar. Look closely to the video clips and you'll see how I use my thumb for the 3rd string, my index and middle for the 2nd and 1st strings. radica: Just bend the G string and sustain the others right? Lyle: There are a couple other riffs that are mixed up in-between the riff theme. Lyle: You want to push heavy so that the string/note keeps sustaining. If you push too light the note might stop ringing as you slide. Michelle: Tough to bend on a plain ol' steel string acoustic - or else my fingers are still too weak. Lyle: Most acoustic steel string guitars aren't meant for bending strings. They are setup with heavy gauge strings for loud rhythm playing. Lyle: Country and blues are all mixed together in many of the rock styles. Example, Jimmy Page from Led Zeppelin uses these basic country riffs all the time in many of his songs. Lyle: Notice how all the riffs follow each chord change. Lyle: Kind of tricky. In Blues style you just learn one minor pentatonic scale for the whole tune! Lyle: In the Country style you get to get a little more progressive in your delivery of melody and lead playing. 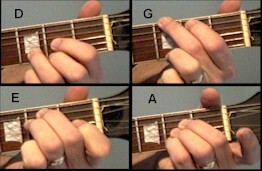 Michelle: Pick versus finger style - one better than the other? Or personal preference? Lyle: I like to use a pick for most everything. In this lesson I used a pick for the rhythm guitar, and fingers for the lead guitar. Lyle: That's all for this lesson, see you at the next lesson!